The proliferation of technology has seen smartphones taking over the technology world. It is no longer a buzz word but the real deal in the current technological application. However, like every other technology, there are some vices associated with the use of smartphones (Beale 35-41). The underlying question is whether the use of these gadgets bring people together to create cohesion and the sense of a community or are the main reason why society is breaking up (Morse). To evaluate this dilemma, the research proposes to evaluate the impact of smartphones on how individual people and groups interact and whether this gadget is responsible for creating a culture of distraction and disconnection. The presence of a smartphone is enough to alleviate and drag down the very essence of a face to face conversation. Research, case studies and the evaluation of peer-reviewed material will be applied to indicate the challenges that smartphones pose to groups and individuals who are engaging each other in a face to face conversation (burdittzackary). In the end, the research will determine whether smartphones are always stealing the spotlight and replacing the traditional model of communication and the impact of this replacement. To achieve this quest, the research proposal is chronologically organized from the introduction, the purpose of the study is then provided and a background on the topic (Morse). Besides, the paper introduces the problem statement to be discussed in the research with the key hypothesis that is held. The next section provides a literature review that determines what scholars and other researchers have contributed on the topic. The design of the research and the methodology adopted is also inculcated with a proper timeline and budget speculation of the study within the given scope of relevance. The integral part of humanity is communication. It is through communication that individuals are better placed to understand each other and themselves. The evolution of technology is a direct correlation of human development (burdittzackary). The implication of this is that technology changes about the demands of human evolution in communication and achievement. Contemporary society has seen changes in the technology sector that have led to communication at an ease and across various levels of human interaction. Through technology, the mode of communication is also determined (Morse). The presence of smartphones has taken the aforementioned a notch higher. Determining how the human interaction between individuals and groups is influenced by smartphones, it is inherent to grasp and have a proper understanding of what is a smartphone. In this section, the essence is to provide a correlation between human interaction and communication and how smartphones influence the flow of this channel (Bradley). From definition, a smartphone refers to a communication device that has advanced phone capabilities. As such, it presents users with magnificent capabilities and computing power that keeps their needs catered on their fingernails. The technology adopted in the design and delivery of smartphones is unique in that it is tailored to engage the users beyond their common interest and needs. The application of this technology has gone a long way in revolutionizing the social world in how people communicate and interact. It is for this reason that every individual in this modern age aims at owing a smartphone from a tender age (Dickerson). The possession of the gadget represents a certain belonging to social class. The superior the smartphone, the smarter the individual, is considered in the social arena (Bradley). Social media is thus dominated by individuals with smartphones, and this poses the question of ethical and smartphones morality when it comes to communication. In the research, this paper proposes to cover the area of smartphones and communication at an individual and group level in more detail (Havel et al.). Key emphasis is paid to the effects and influence of smartphones on individuals and groups on personal development and attention. Any reputable research aims at addressing a central question or idea. This is considered the problem statement of the research. In this proposal, the case is not different; the research central idea is to determine to what extent smartphones influence modern communication both at an individual level and a group level. Smartphones are responsible for providing applications that merely manage every aspect of daily human life. The result is increased efficiency, communication, and productivity. Therefore, the very nature of the presence of smartphones cannot be overlooked since the devices offer a variety of advantages to human life (Morse). 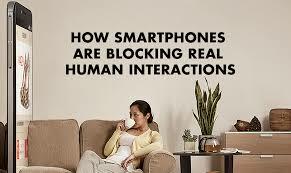 Despite this, the constant connection to smartphones, the internet, and various connectivity comes distraction and disconnection. It is worth noting that the increased growth rate of smartphone and its associated technologies has resulted in a transformation of human life (Shin et al. 2207-2214). Modern culture is characterized by communication, socialization, and interaction with the smartphone being the primary driver of the interaction.